Inspiration: I love My Little Pony Friendship is magic. I grew up with the original My Little Pony and I love both gens, they each have their own amazing qualities. 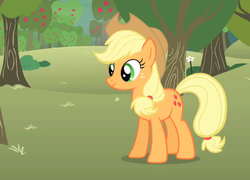 Applejack is one of my favorites because she's a hard worker, like myself. Least Favorite Aspect: With the cyberlox pony mane from Head Kandi I couldn't wear my cowboy hat, ah well. Easiest Task: Pretty much everything, I pulled the majority of it right out of my closet, lol!